The Swaminarayan Akshardham temple is a Hindu Mandir located in East Delhi near Noida Mor. 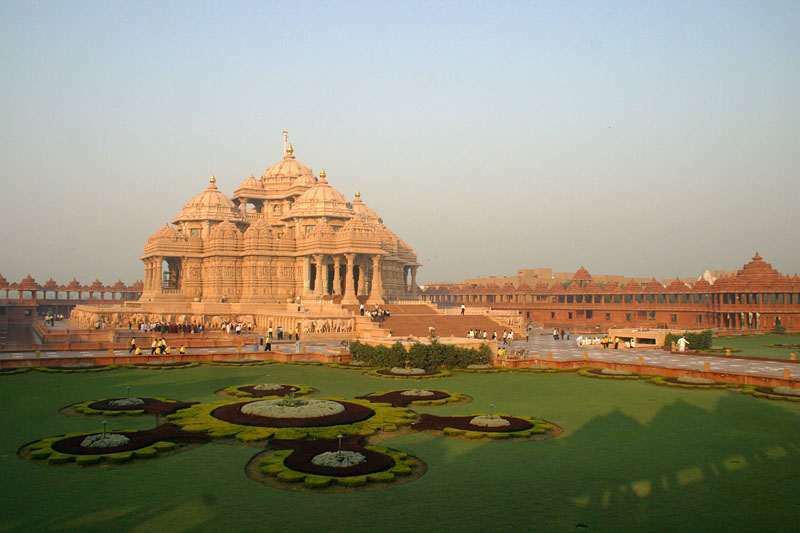 The temple is also known as Akshardham Temple or Akshardham Delhi. The temple is adjacent to 2010 Commonwealth Games village and near the bank of Yamuna River. The temple was inaugurated on 6th November 2005 by then President of India Dr. APJ Abdul Kalam. It is one of the most visited place of Delhi and popular amongst the tourist of all India and foreigners also. 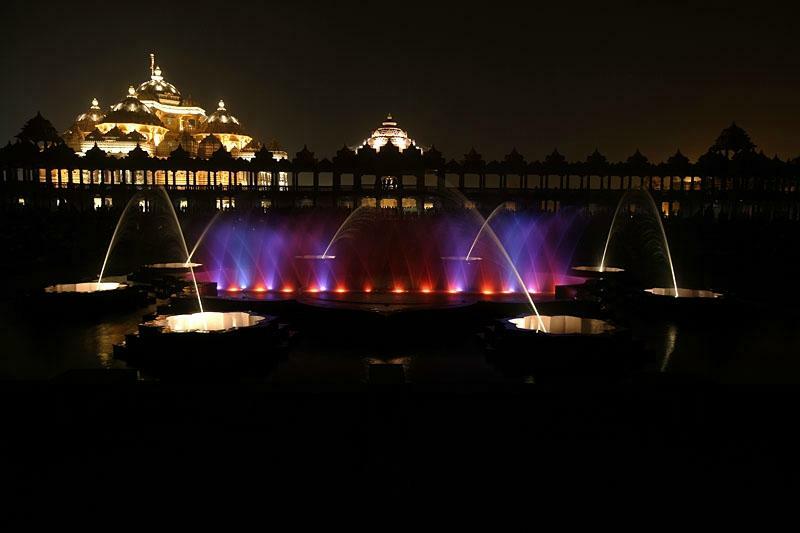 Akshardham Temple spreads in 90 acre area (360,000 sq. meters). Among 90 acres of land, 60 acres land was allocated by DDA and 30 acres of land was offered by the Uttar Pradesh Government. Construction was begun on 8 November 2000 and it was opened on 6 November 2005. It took almost 5 years to build the entire temple. Akshardham Mandir is located inside the Swaminarayan Akshardham complex and it is the main attraction of the entire complex. The main temple is 141 feet high, 316 foot wide and 356 feet long. It has 20,000 statues of Acharyas, sadhus and devotees; it has 234 carved pillars and nine domes as well. 148 life-sized elephants are situated in the temple. 11 foot high statue of Swaminarayan seated under the central dome. This exhibition focuses on values of Hindu culture like non-violence, perseverance, morality, prayers, family harmony. Various multimedia technologies are used to present the message in a vibrant and important way. The different technologies used are immersive projection, 3‐D dioramas and audio‐animatronic figures. Boating and walking is also included in this exhibition. It is a very big theater with giant screen of 85 feet wide and 56 feet tall. The theater shows the Neelkanth Yatra in an epic way. The show depicts the journey of a young boy named Vani, travelling across the country. He treks across the country covering a total distance of 12,000 km. The movie is way to remind ourselves about the value of sacrifices, services. The movie is shot at 108 different locations. Most of the people among the crew volunteered for the movie. This interesting boat ride within the Akshardham temple takes you through the ancient Indian history. The boat sails you through the oldest university (Takshila). It covers some of the important events happened in the Indian history. It is a 12 minute long boat ride which covers ancient Indian markets, teaching and family life. You will also encounter the times of Sufi saints like Kabir, great philosopher like Swami Vivekananda, mathematicians like C.V. Raman, Srinivasa Ramanujan and other such great people. The Musical fountain is also known as Yagnapurush Kund. The kund comprises of 2870 steps, and yagna kund is present at the bottom of it. It is India’s largest step well; its steps are used as seating area for the night musical fountain show. 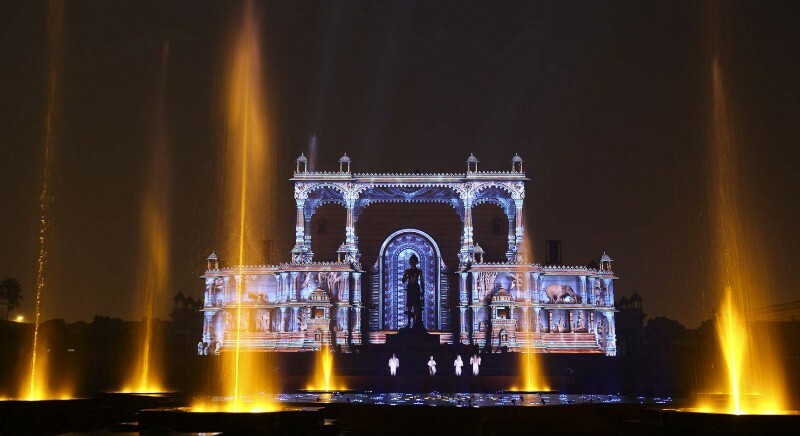 The show depicts the circle of life with the help of an amazing combination of water and light. The effects are really mesmerizing and it is a must watch of you visit Akshardham temple. The musical fountain has dimensions of 300 feet (91 m) by 300 feet (91 m). This thematic garden consists of green gardens which are very well maintained. The main attraction of Bharat Upvan is the various statues present inside the garden area. The 67 statues depict the role models of Indian revolution, the freedom fighters, and the great people of India. It is really inspiring too see the sculptures of people who made a difference in India’s progress. Exhibition tickets includes all three Exhibitions in a single tickets. Akshardham Temple is located on the banks of Yamuna and the nearest Metro station is Akshardham Metro station located on Blue line. Delhi Metro is the best and comfortable way to reach Akshardham Temple. New Delhi Railway Station is 10 KM and Indira Gandhi International Airport is 25 KM away from here. Visitors can reach here via city bus, auto and taxi. Parking facility is available in the temple complex, which can accommodate large number of vehicles. Shoe rack is available in the temple. Mobile, camera and other electronic gadgets are not available in the complex. Mobiles and camera deposit facility is available near the entry gate of temple at free of cost. Drinking water and canteen are available is inside the temple, canteen serves the fresh and delicious food for its visitors. Wheelchairs are available for a refundable deposit of 100 Rs. Attire should be respectable and it must cover shoulders and knees. Visitors can opt of Sarong if their dress as not per the dress code of the temple by paying 100 Rs (refundable security). At least 4 to 5 hours are required to visit the whole temple and on weekends and holidays whole day can be consumed in the temple. Visitors guide can be downloaded from Akshardham Delhi official website. Delhi has large number of tourist and religious places. Travelers should also visit Sai Baba Mandir Najafgarh, Chhatarpur Temple, Jhandewalan Mandir, Hanuman Temple, Kalkaji Mandir, Iskcon Temple, Birla Mandir, India Gate, Purana Qila, Delhi Zoo, etc during the trip to Delhi. how much fee for the foreign visitor?